In this model, two disk galaxies collide. Yellow/white shows the stars in the model, while blue shows the interstellar gas. The whole sequence covers approximately one billion years. Upper Left: The galaxies approach one another, just before they collide. 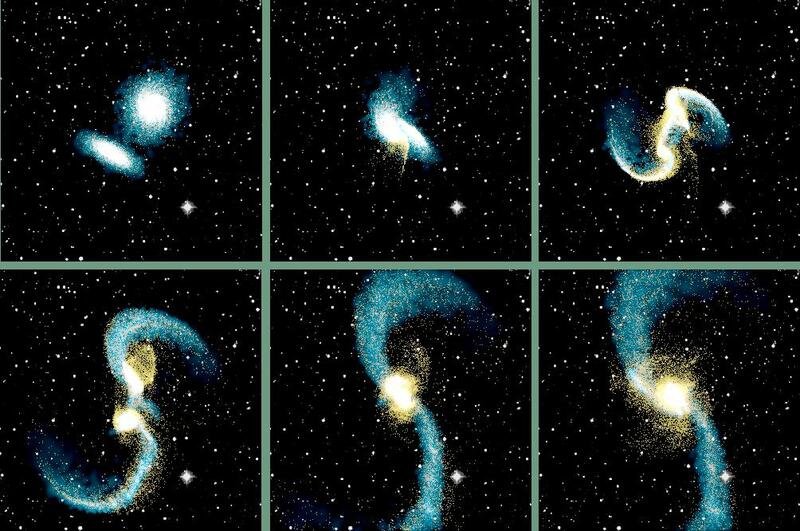 Upper Middle: Immediately after collision, the galaxies become very distorted. Upper Right: The tidal tails begin to expand away, as the galaxies move apart. Lower Left: The galaxies turn around on their orbit and begin to fall back towards one another, as the tidal tails continue to expand. Lower Middle: The galaxies re-collide and merge into a single object. Lower Right: The merger remnant settles down after the collision, while some material from the tidal tails streams back into the remnant.